Artemis March, PhD, MBA, Vassar graduate, and former Fellow at the Radcliffe Institute, had been evolving her own brand of nonfiction narrative for twenty years without realizing it was preparing her to write this book. 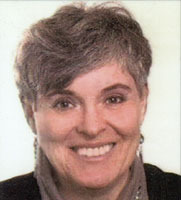 A sociologist by training, she first got into the storytelling and paradigm shift business at the Harvard Business School where she designed and wrote 30 case studies, teaching notes, and industry notes, several of them best-sellers (nearly 700,000 units sold) for their MBA and Advanced Management Programs. Narrative and its interrogation continue to be one of the tools through which she helps business and healthcare leaders shift their mental models by drawing out and applying transferable learning embedded in their own or another's story. In a similar vein, Dying into Grace is a full-length case study whose narrative can be explored and reflected upon for guidance. Its final two chapters make explicit some of the learning and wisdom enfolded in the story, and draw on Artemis' knack for translating appropriately from the singular to the generic. In fluid, unstructured situations where people talk past each other, or can't get their hands around it, or don't know how to begin a conversation or project, Artemis organizes the content so that a productive conversation can begin. Her maps of the problem and/or solution space identify big chunks of "real estate" in relation to each other, thereby getting people on the same page. This focus on relationships, connections, and interdependencies permeates her thinking, and informed the relational paradigm she lived with her mother before she mapped it for others. Through deeper excavations into a client's unique situation, Artemis may create a model or framework that reveals its structure, thereby making it conscious, discussable, and actionable. Her models embody her gift for recognizing simplicity underlying detail complexity and order implicit in seeming chaos. Each dying-caregiving story is also unique and seemingly without form. In Dying into Grace, Artemis draws on her signature gifts to distill the inherent structure of family caregiving, give form and voice to a dance of ephemeral moments and subtle movement, and create a groundbreaking, relational paradigm that can release the transformative potential in dying. Her model of the Caregiver's Story orients caregivers in real time and gives visibility, shape, and dignity to their culturally invisible experiences, stresses, conflicts, and triumphs. During the past decade, Artemis has brought her quantum/relational/systems thinking and passion for process and operations excellence into improving healthcare delivery. Her work is informed by understanding that safety (zero medical errors and hospital-acquired infections) and coordination of care must be designed into everyday practice, that real change happens on the ground floor, and that attempted quality/cost improvements deliver on their promise only when a safety culture of transparency and accountability is institutionalized via multidisciplinary teams, partnering with patients and families, and vastly simplifying workflow around the value stream by those who do the work.